I have a fetish for pink perfumes, so when I saw Bright Crystal I knew I had to own it. This will probably result in a biased review due to my favoritism toward anything pink. Fortunately, dear reader, Versace’s Bright Crystal will not disappoint. In fact, I believe you will find this perfume absolutely delightful. Versace Bright Crystal was introduced in 2006. It comes in a clear bottle with an over the top crystal lid. The presentation is beautiful, and the container is designed to match its name, Bright Crystal. The first impression of Bright Crystal is crispy and fresh. It is comprised of yuzu and pomegranate with a delicious blend of peony, magnolia, and lotus flower. There are no heavy base notes that can sometime become overbearing. However, if you like perfumes that are stronger, Bright Crystal is on the light side. Therefore, you will need to reapply often if you do choose to use it. 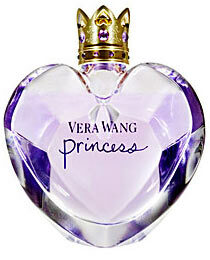 Vera Wang Princess has become very popular since its introduction in 2006. The perfume comes in a purple tinted heart-shaped bottle that reminds of me a 12-year-old’s plaything. I picked up the tester and sprayed, and wow, it was sweet. Not an attractive sweet scent, but a sugary fragrance accompanied by an overwhelming amount of alcohol. Princess is composed of fruity notes and vanilla, with musk and amber as its base notes, accented with dark chocolate. According to Vera Wang press release, “She is the fashion forward ‘it’ girl in her teens and twenties.” However, as someone who is in her twenties, I do not relate to Princess at all. In fact, I cannot imagine Vera Wang Princess on anyone but a little girl in her pink ballerina dress. Perhaps this is what the perfumery sought to achieve – a sweet scent for a cute Princess. But it just doesn’t work for me like it does for those who are devoted to popular culture and blindly follow the trendsetter. If you want to try it out of curiosity, you can purchase Vera Wang Princess at discount perfume stores rather than department stores that charges full price. Regardless of its popularity, Princess is not for everyone. Remember, perfume only smells good when your nose tells you it smells good.